I was hesitant to make this look because Vasily Kandinsky's paintings, though at first glance may seem chaotic and random, are actually extremely precise and rhythmic. Kandisky admired musicians and in many of his most famous paintings he sought to visualize music. I chose to focus on Bauhaus-era Kandinsky, when he taught at the famous German institution from 1922-33. This is the time when he experimented most heavily with a variety of purely geometric shapes, and I very much wanted to explore how these kinds of shapes can sit on the face. Also, the German post-WW1 and pre-WW2 world swirling around him at this time was particularly explosive, culminating in Hitler's 1933 closure of the Bauhaus and Kandinsky's move to France. 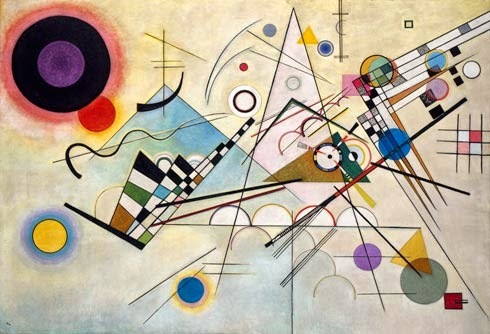 I use the photo to the left as an example of Kandinsky's work because it includes such a wide variety of shapes and colors (and intersections of the two). 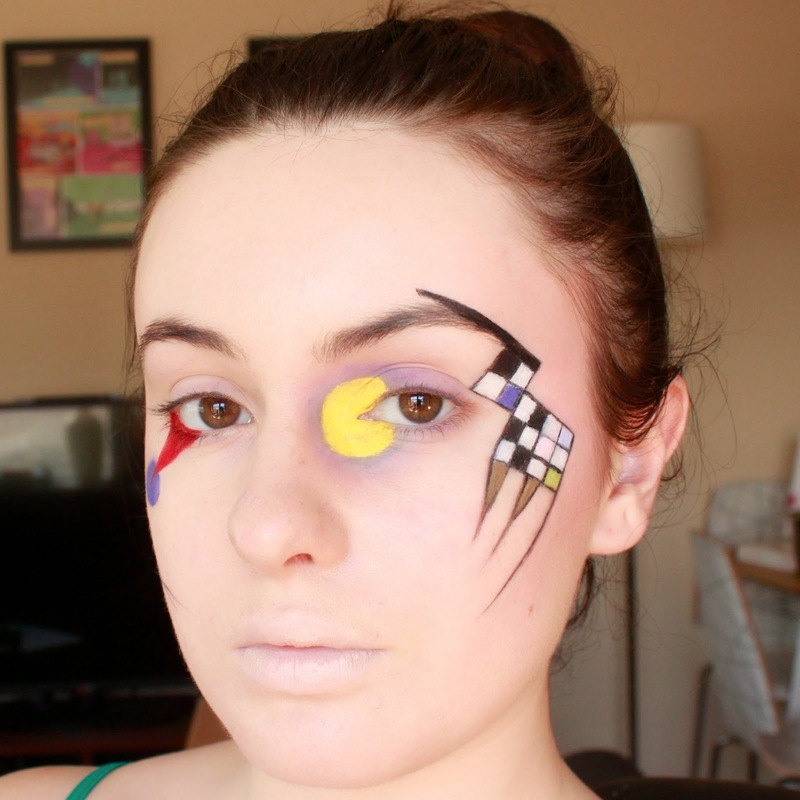 However, as you see, I formed a much simpler composition on my face for the sake of balance. 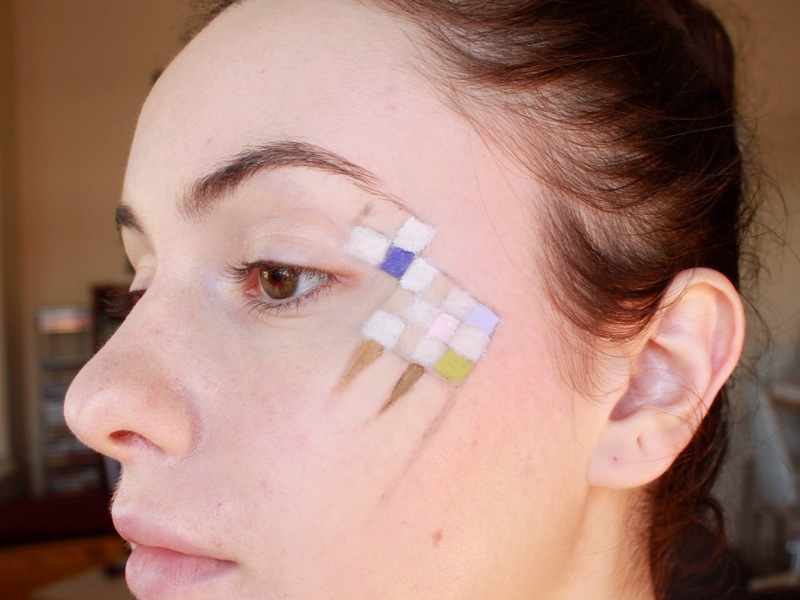 My process with this makeup really got me considering the jump from having a blank, flat canvas on which to arrange a composition to having a blank face, which brings its own pre-existing features and three-dimensionality into consideration. But, that's a longer thought for a different post! This look didn't come out as complete as I'd have liked; I frankly underestimated how long the precision required for this look would take, and ran out of time in my day to work on it. I'm not posting a full tutorial, but I'm including some process shots and material information. Also, have to give a shout out to Jennifer of the lovely blog Blush and Fuss for suggesting I try Kandinsky! I started by sketching out my shapes with a gray liner pencil. I used tape to get the outer lines as precise as possible. I also used a pink blush from the main shape to my hairline to give it some dimension. I had an old watercolor palette that I cleaned with 99% alcohol and then used to mix my colored liner gels. I used NYX's Jumbo Liner in Milk, Maybelline's Gel Eyeliner in Brown, Clinique's Brush-On Cream Liner in True Black and Iglot's AMC Eyeliner Gels in #84, #82 and #79 in a variety of combinations to create light blues, browns and greens. Inglot's gels are such amazing colors and very reasonably priced for their quality. They are extremely long-lasting to the point that they can be difficult to remove, so pick a gentle but good makeup remover and work slowly and patiently so as not to irritate your skin. Pointed Q-tips dipped in Bioderma and e.l.f. 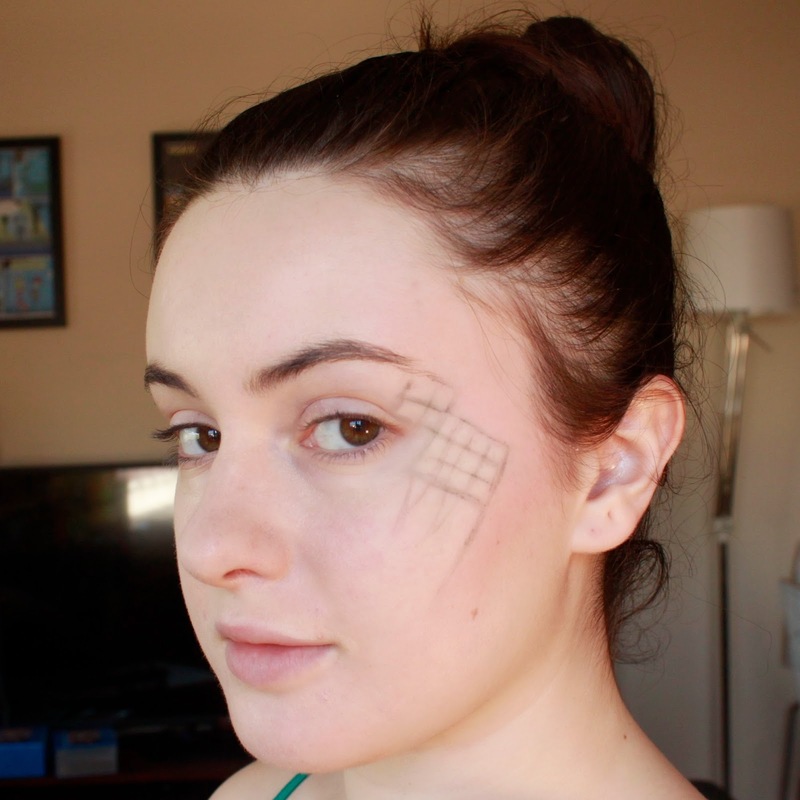 's Makeup Remover Pen were also life-savers for me in the this look, as the straight lines almost never happened the first time around! This is where things got messy! Damn it's hard to draw straight lines freehand, even with a pointed liner brush. As I said above, a lot of time here spent on cleanup of these lines. Here is the other side of my face which, as you can tell, I spent less time on. That checkerboarding took so much time that at this point I needed to leave the house in an hour or two and it shows. 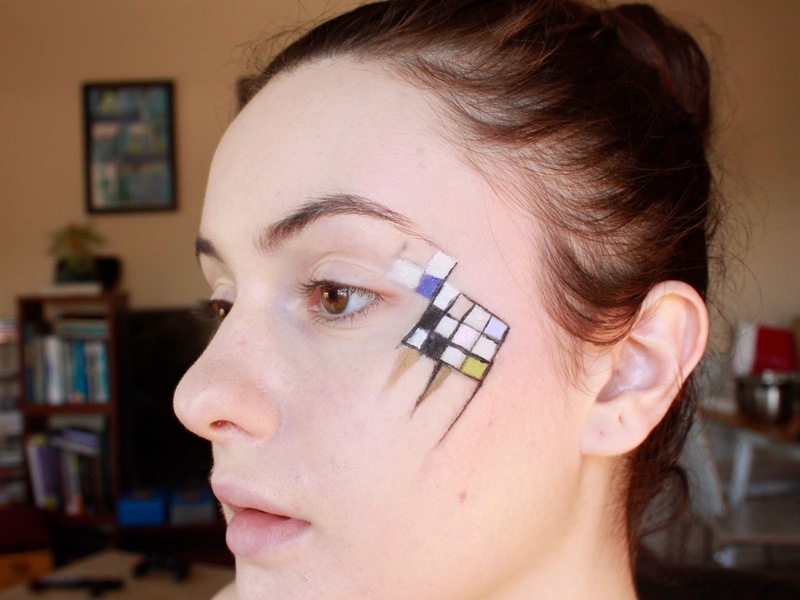 Too bad, but this was a good insight into the immense amount of time needed for makeup this precise. As you can see, I concealed my lips to make the eye & cheek work the full focus. 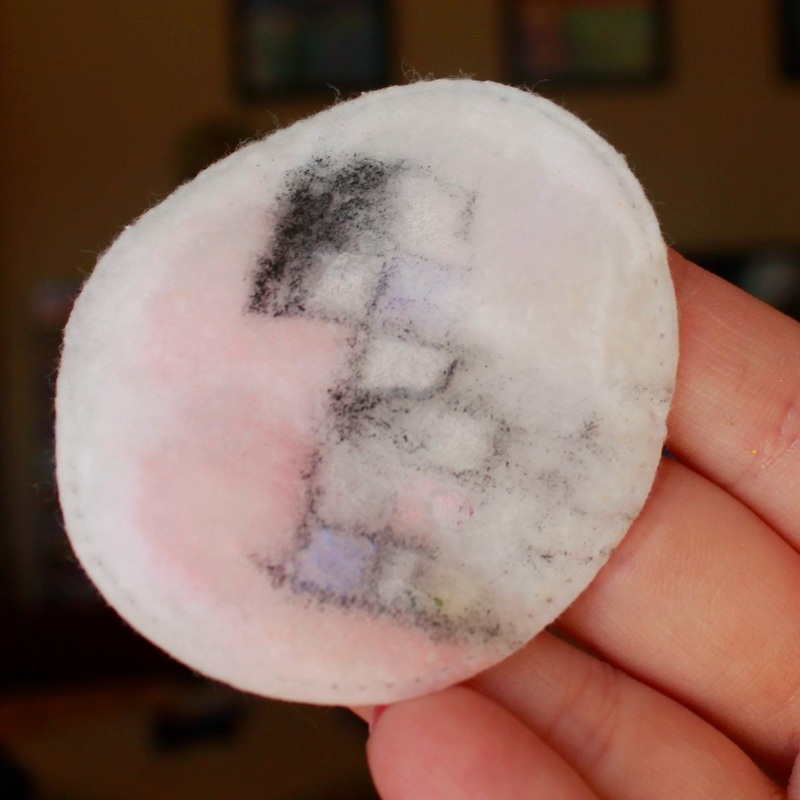 As an example of the wonder of Bioderma, I pressed this pad soaked in it on my makeup for less than 10 seconds and this is what I got! Wonderful makeup remover. Oh my gosh this is amazing! I love it! Thank you Jennifer! Forgot to give you a shout-out for suggesting it, though! Adding that to the post now. 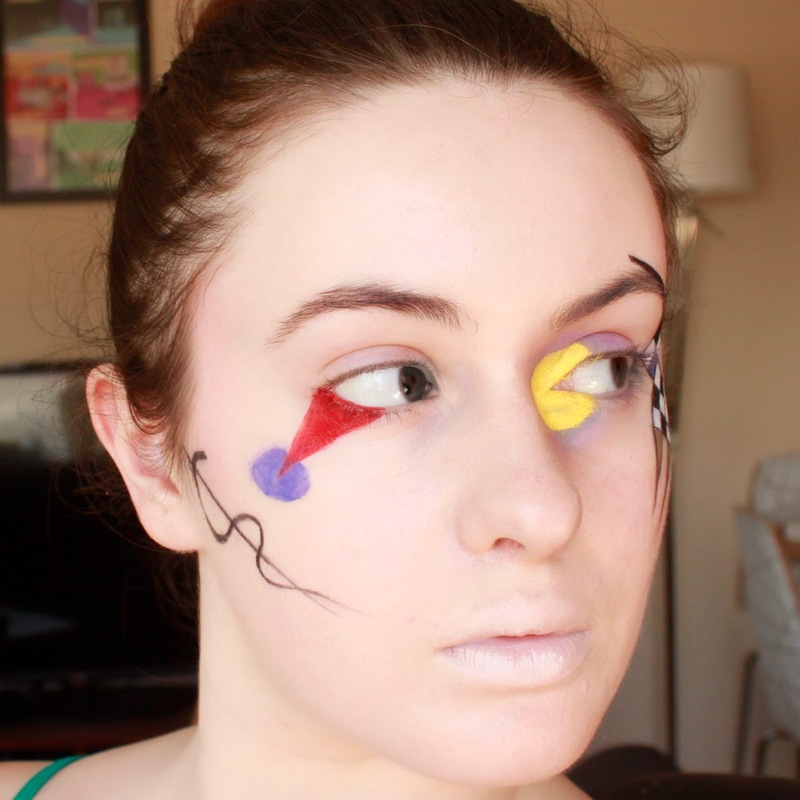 I am a huge fan of Kandinsky's paintings, id never of though of interpreting it into makeup! its such a cool concept and looks amazing! I have mentioned you in my post today, after your lovely comment on my blog the other day. I hope you don't mind? Thanks! Not at all! So sweet of you to mention me.